Cannot be optionally engaged. The first treachery revealed each round gains doomed 1 and its effects cannot be canceled. Shadow: Either raise your threat by 4, or this attack is considered undefended. 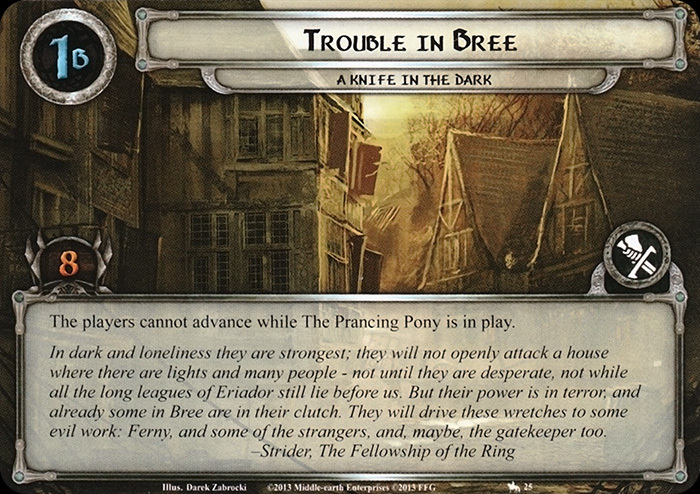 Immune to player card effects. 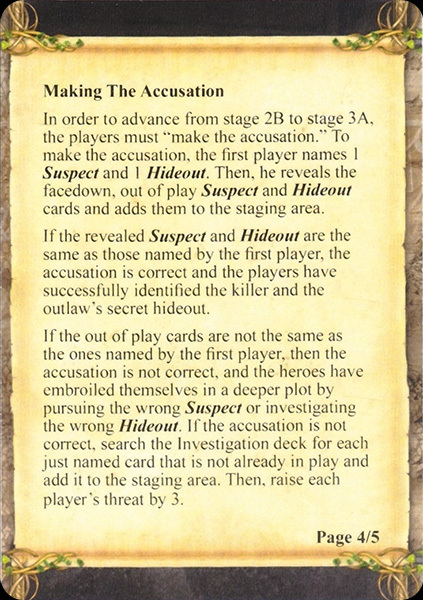 While Bill Ferny's House is in the victory display, each Suspect, and each shadow card dealt to a Suspect, is immune to player card effects. 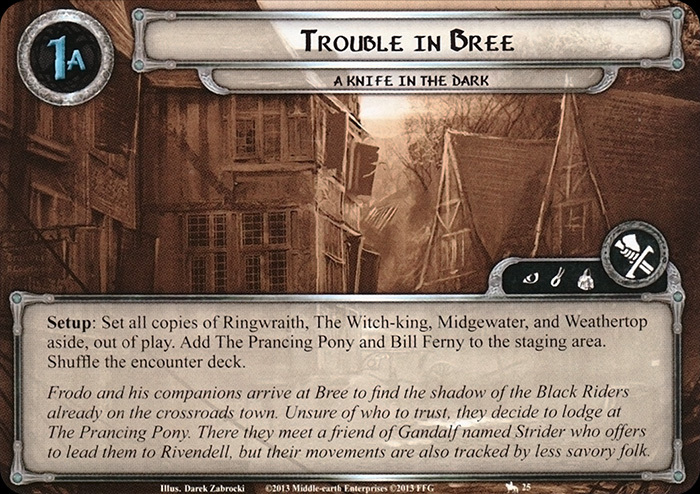 Travel: Search the encounter deck, discard pile and victory display for Bill Ferny and add him to the staging area. Shuffle the encounter deck. You are playing Nightmare mode. 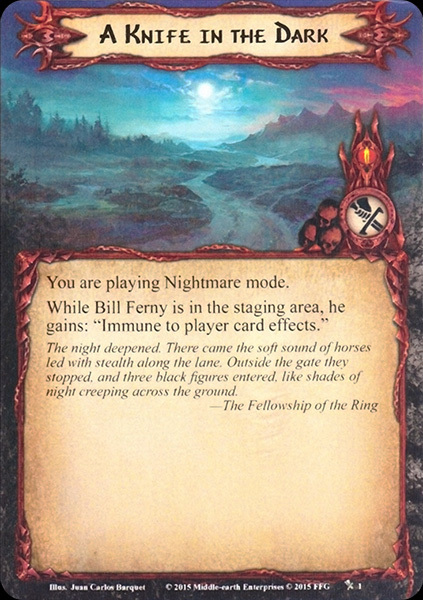 While Bill Ferny is in the staging area, he gains: "Immune to player card effects." 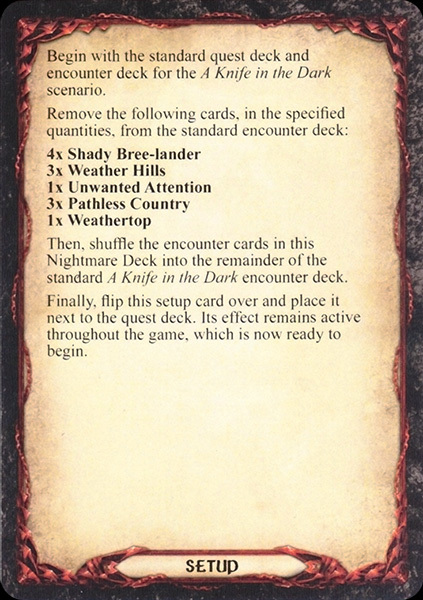 Begin with the standard quest deck and encounter deck for the A Knife in the Dark scenario. 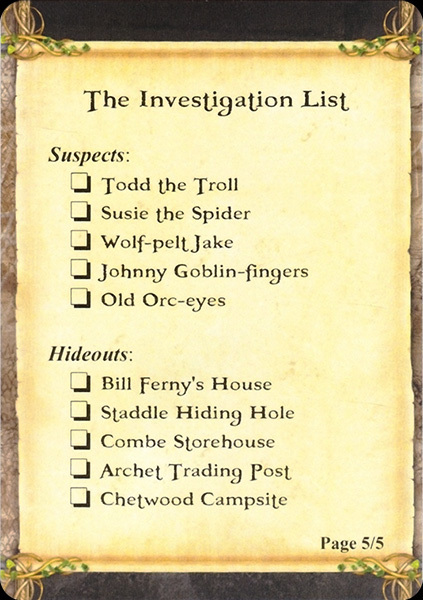 Remove the following cards, in the specified quantities, from the standard encounter deck: 4x Shady Bree-lander 3x Weather Hills 1x Unwanted Attention 3x Pathless Country 1x Weathertop Then, shuffle the encounter cards in this Nightmare Deck into the remainder of the standard A Knife in the Dark encounter deck. Finally, flip this setup card over and place it next to the quest deck. Its effects remain active throughout the game, which is now ready to begin.